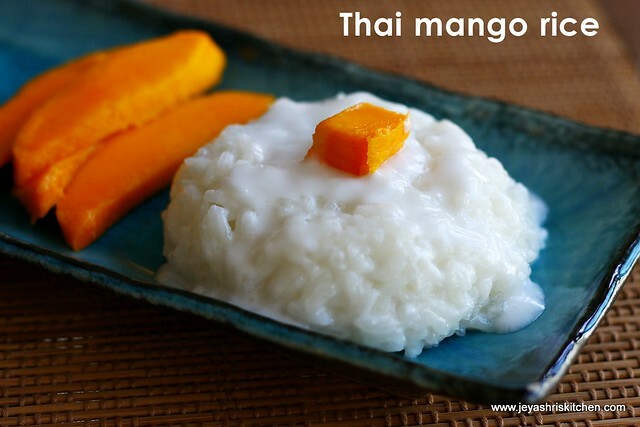 Thai sticky rice with mango is a traditional thai dessert. Here in Singapore we find this Thai sticky mango rice in almost all the food courts. Though i have never tasted this, but suresh used to tell about this sweet mango rice many times. Somehow i always thought this combo will be wierd and will not work out nice. Since me always a mango eating person, only i will try a dessert with mango if am over loaded with mangoes. I have mentioned this in my Mango lassi post too. This year when Ministry of mangoes started their online booking, i am immediatley ordered 1 carton of alphonso mangoes. 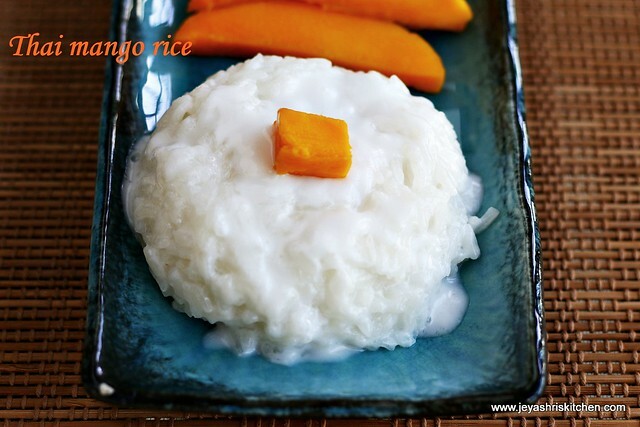 While casually talking with my friend, she told that she is going to make thai stickly mango rice for a weekend dessert, as her entire family fond of that. I asked her the procedure and took a small portion of glutinous rice from her to try out this recipe of thai sticky mango rice. To my surprise it turned out very well and we all loved it, personally being a reluctant person to try out new cusine, i personally loved it. The coconut milk mixed with sweet mangoes is a super duper combo. Try this out and let me know your feedback. **Adjust the water accordingly. The water mentioned in the recipe is for thai glutinous rice. I got the thai glutinous rice from fair price. For my Singapore and malaysia readers you get thsi rice easily available in all stores. Price will be less tha 2 singapore dollars for 1 kg of rice. Traditionally the rice is soaked over night and stramed for 20 minutes . But i just soaked for 1 hour and cooked in pressure cooker till 4 whistles. While soaking add the thin coconut milk to this . If using basmati rice for one portion of rice add 3 portions of water. Same as the case for sona masoori or raw rice too. Cook the thick coconut milk in a low flame. Do not allow this to boil it will curdle. Add salt and sugar to this. Let the coconut milk becomes hot. Switch off the flame and reserve 1/4th portion of the coocnut milk and add the rest of the coconut milk to the cooked rice and nicely mix it up. Let this sit for 15 minutes. Peel the skin of the mangoes and slice them, preferably into cubes but traditionally they serve it cut horizontally. I found bite size cubes more easier to eat. 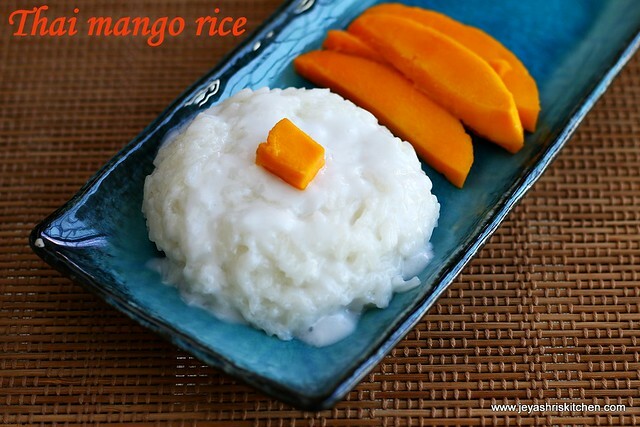 Cut the mangoes while the rice is cooking and keep it in the refrigerator. So that it will be chill while serving this thai mango dessert. The rice can be cooked on stove top too but it will take little extra water and time to cook. Saok it for more time if you are cooking on stove top. Also as mentioned above you can soak it and steam the rice by tieing the rice in a muslin cloth in a idli pot for 20 minutes. Coconut milk when mixed with mangoes gives a fantastic taste and make the dessert out of the world. Jeyashri looks yumm. I use thai rice for pongal and Bisi bela. ..gives an awesome flavor and texture. I love this.. Looks very tempting.